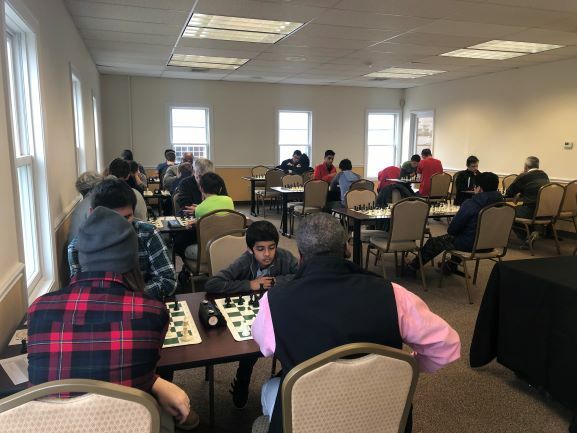 Despite a looming snowstorm, 36 players turned out for CCFC’s annual club championships. With $600 on the line, plus $100 bonuses for perfect scores in both the OPEN and U1800 sections, the competition was fierce. 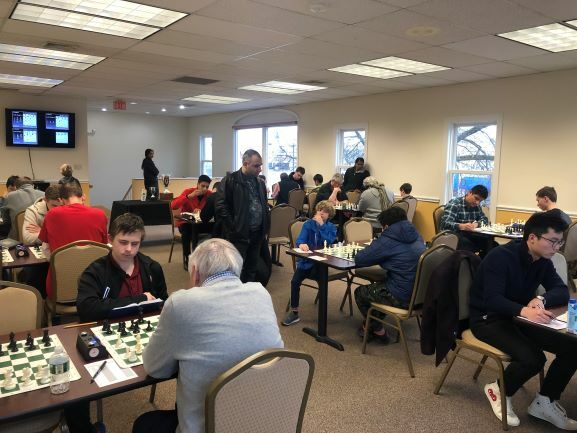 The OPEN section featured favorites GM-Elect Nicolas Checa and IM Hans Niemann, six masters and a bevy of strong players vying for the U2200 and U2000 prizes. 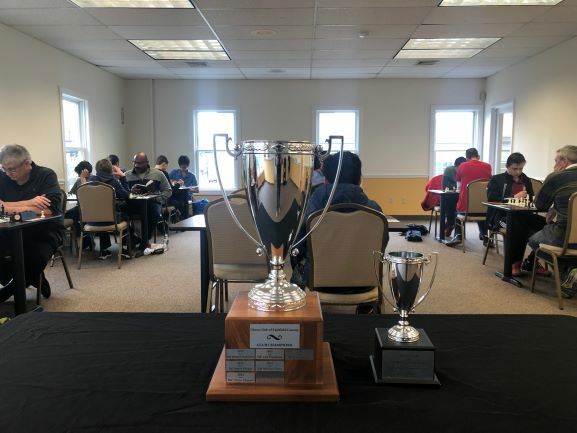 GM-Elect Checa, the only player to win the CCFC Championship title twice, was looking to secure his third, while IM Niemann had won the title once before and now was looking to tie Checa’s record. Both players handily won their first two games. Niemann continued his winning ways in round 3 against NM Ian Harris. 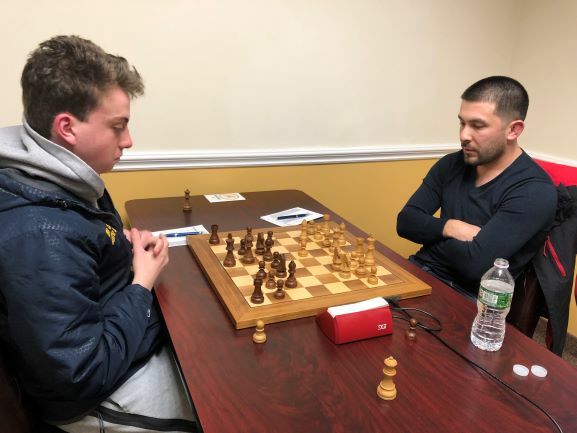 Meanwhile, CCFC instructor NM Arslan Otchiyev defeated Checa on board one, in what was perhaps the upset of the tournament. This set up the decisive final round match between Otchiyev and Checa, the only two players still perfect, for the title. A win would net either player the title, plus $200 in prize money. With many pieces getting exchanged early in the middlegame, it looked as though the game was heading towards a draw with opposite colored bishops. However, Niemann used his 3 vs. 2 pawn majority on the kingside to break through Otchiyev’s defenses to convert the game to a win! With that final round decisive result, IM Hans Niemann became the 2019 CCFC Club Champion, only the second player to do so for the second time! Meanwhile, the top U2200 prize went to NM Derek Meredith with 3/4 points and the top U2000 prize was split between Todd Licata and Xan Meister with 2/4 each. Each of these players also had impressive runs to the finish line. 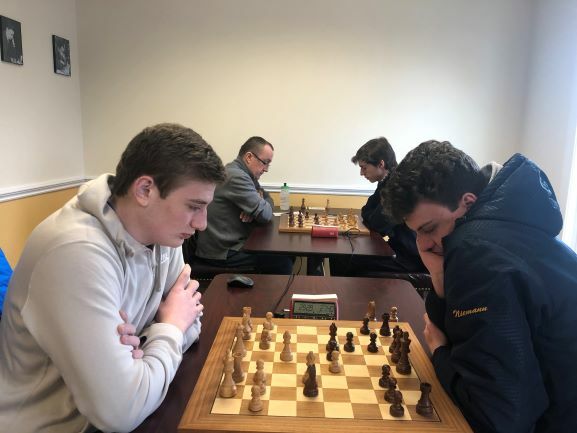 The U1800 section was no less exciting with 18 players competing for the same amount of prizes as in the Open section. Top U1800, U1600 and U1400 would all receive $100, plus a $100 bonus for any player that scored a perfect 4-0 score, a real possibility with 18 players. As early as round two, the favorites began to fall, with Justin Paul defeating top seeded Robert Cheng. First place was now opened up to the field. Justin Paul continued his winning streak in round 3, taking down second seeded Club Owner Melvin Patrick in a battle that lasted deep into time pressure after all other games had finished. This led to the final round showdown between Justin Paul and the only other player with a perfect score, Leo Bykhovsky. A hard fought game led to an eventual draw and each player receiving $100 for their efforts. 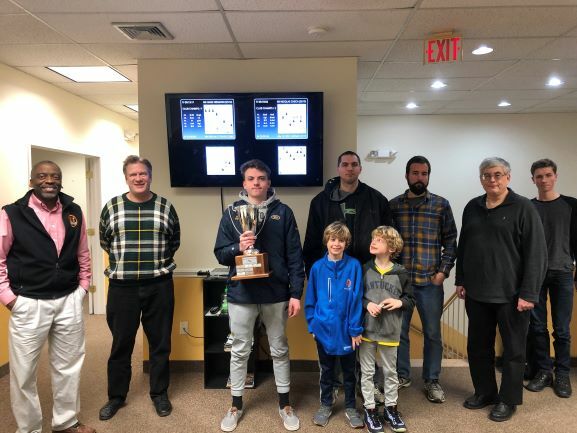 Impressively, going into the tournament, Paul was eligible for the U1600 prize and ended up tied for the U1800 prize and earning nearly 100 rating points! The U1400 prize was split three ways between Andrew Zhong, Thomas Sargent and Max Meister. Each scored their own slew of upsets to 2 out of 4 and take home $34! Congratulations to all of today’s winners and thank you to everyone that participate in this year’s championships!